Have you started a new diet that you’re struggling to stick to? Or, perhaps you’ve given up a foodie vice (chocolate is always the big one at Manchester University Press!) for lent. As a nation, historically, we’ve more often faced the problem of food deficit rather than a food surplus. This has been particularly true in times of war. This week sees the publication of the latest book in our series, Cultural History of Modern War. 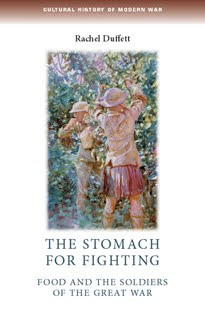 The Stomach for fighting by Rachel Duffett is all about diet, nutrition and food supplies in the First World War. Food is central to morale and physical performance, but also fundamental to emotional and social identities. While the British army provided more food than many soldiers ate as civilians, calories do not address the central complexity of eating, which is rarely about nutrition alone and comes freighted with emotions that have little to do with psychological need. The stomach for fighting is brilliantly written and gives an insight into the hardships facing soldiers at the front as well as the deprivations at home.